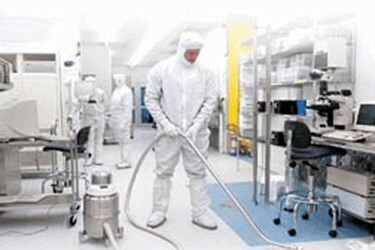 How Do I Choose The Right Portable Dust Collector Or Cleanroom Vacuum? When selecting a compound vacuum, HEPA vacuum, or ULPA vacuum for your facility, you will quickly find there are many options. From basic vacuums with a collection container and motor to those that are much more sophisticated and complex, it’s easy to lose sight of what’s important. Determining whether you need an intermittent-duty vacuum or continuous-duty vacuum is the first step in narrowing your choices. Your final decision should depend on the requirements of your specific application and your electrical requirements. If your application requires constant collection, continuous-duty is the best option. Continuous three-phase power is also more economical; however, not every plant has three-phase power available. Single-phase power is more prevalent but can limit the power of the vacuum. Nonetheless, if the vacuum will be used for general cleanup of work areas for approximately an hour or less each day, an intermittent-duty, single-phase industrial vacuum is your best bet. Because of their larger size and increased suction power, central vacuum systems are capable of handling several applications at one time, including local exhaust ventilation and the collection of fine powders. A central system can also be isolated outside or in a separate room to control noise and used with accessories hooked up to wall inlets. Each system has its pros and cons, but for many manufacturers the decision between central vacuum systems and portable dust collectors comes down to the application. If you need to clean very specific areas – such as multiple neighboring clean rooms – a central vacuum system with a drop-down hose in each working area may be best. If you need the flexibility to clean the entire plant – including stairwells, corners and overhead areas – then a portable dust collector system is most efficient. If your vacuum will be used in a cleanroom environment, a high efficiency particulate air (HEPA vacuum) or ultra low penetration air (ULPA vacuum) filter is a must. The location of the filter within the vacuum is also critical. Because contamination standards in pharmaceutical industries are more stringent than other industries, HEPA/ULPA filters before and after the motor will help achieve optimal efficiency. Placed “downstream” or after the motor, these filters will capture the dust created by the motor’s commutator and carbon brushes and keep it from being released back into the environment through the exhaust stream. An “upstream” filter – before the motor – protects the motor from the potentially harmful debris you are collecting. An upstream filter will help prolong the life of the motor and also safeguard employees if maintenance is needed on a motor. Aside from superior filtration, simple, smooth construction – like on stainless steel vacuums – is also important for a cleanroom vacuum as it prevents contamination by the vacuum and is easier to clean. Non-particle-generating material such as non-porous stainless steel vacuum construction is preferred in controlled environments, and hoses and attachments should also be smooth for fast, simple sanitization and validation. Don’t forget to take spill response into account when purchasing a cleanroom vacuum. If you try to collect liquid with your dry-only vacuum you can easily ruin your investment and cause serious injuries. Wet-collection vacuums must have a grounded bypass motor to avoid electrical hazards. A stainless steel or polyethylene tank to prevent corrosion is also a good feature to look for, along with an automatic shut-off valve to prevent overfilling. No matter what type of portable dust collector you choose to safeguard against multiple sources of contamination, superior filtration is key. In most cases, filtration is what sets apart a quality vacuum from a common, shop-style vacuum. For peak operating efficiency, a vacuum should have a multi-stage, graduated filtration system, which uses a series of progressively finer filters to trap and retain particles as they move through the vacuum. As mentioned, HEPA vacuums and ULPA vacuums have become standard in the pharmaceutical industry, and a multi-stage system is key in protecting these filters from blockage and excessive wear and tear, maintaining peak performance. A vacuum’s filtration system should also use oversized filters, which slows airflow action across a larger surface area to optimize the air-to-cloth ratio. This allows the vacuum to easily collect large volumes of debris over extended periods of time – while once again minimizing maintenance. Nilfisk CFM, the industrial vacuum division of Nilfisk-Advance America, helps its industrial customers meet their individual cleaning requirements and challenges with an extensive range of high-performance vacuum cleaners. From its Malvern, Pa, headquarters, Nilfisk CFM provides industrial vacuums for heavy-duty applications that require maximum suction power, and specialty vacuums for clean applications that demand “absolute” air purity and facility cleanliness. The company’s vacuums are equipped with industry-specific features and exceptionally efficient filtration systems, ensuring dust- and debris-free facilities in the food, chemical/ pharmaceutical, electronics, metalworking/ powder coating, and a variety of manufacturing industries. For more information, visit www.pharmaceuticalvacuum.com.